Two-thirds of IT managers surveyed for CDW.G's 201121st Century Classroom Reportsaid that their districts plan to upgrade or improve classroom technology by the end of 2013. Yet, nearly half of them had to cope with smaller budgets in 2011 and will likely face similar constraining circumstances going forward. Thanks to the mass consumerization of technology, K-12 students are now some of the most enthusiastic and savvy users of state-of-the-art mobile computing devices. 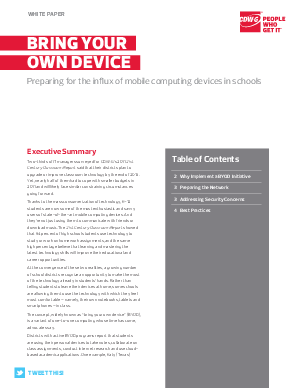 The concept, widely known as "bring your own device" (BYOD), is a variant of one-to-one computing whose time has come, advocates say.